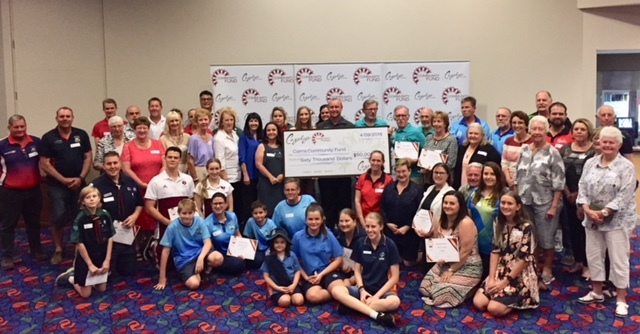 The 11th annual Cazalys Cairns $60,000 Community Fund, wrapped up on Tuesday the 4th September with a presentation ceremony held at Cazalys. Over 80 dignitaries and worthy recipients were in attendance to see how the $60,000 had been allocated this year. Cazalys has contributed a massive $570,000 in Cash directly to those who help support our Community since the Cazalys Community Fund was launched in 2008. The purpose of the Fund is based on a common view of community contributions and the need to support, our wider community groups and individuals, with a little extra funding. Cazalys success is imbedded in our engagement of the Cairns Community from the Board right down to our great staff. Each year, directly or indirectly Cazalys will support more than 180 organisations per annum. – In partnership with AFL Cairns, our direct cash contribution is in the millions to the clubs, ovals, umpires and the kids to support our great game AFL in the Far north. – We have raised in excess of $50,000 for the Hospital Foundation in the last six years. – Our staff contributes to the annual Cancer Councils biggest morning Tea and the RSPCA cupcake day raising over $2000 in sugar baked treats per annum. – We participated in the Parma For a Farmer fundraiser and Great Northern Let It Pour fundraiser raising a combined total of $3000 for the 2018 Drought Relief. “A community Club is a unique model and something we should protect and be proud of- when you support a community club, you are supporting the community” said Jason Wale. We also want to thank our Judging panel for this Year, Councillor Cathy Zeiger, Louise Montafia from the Cairns Post, Richard King from Southern Cross Austereo and Cazalys Board Members, Sam Merino (Deputy Chairman) and Stephen Olle (Treasurer). These people have given up their time and in turn guarantee the credibility and independence in how the monies are allocated to the recipients.